If you got a problem with the game or the forum, checking here before you post a help thread is always good. Read the list below to find something related to your issue. Unable to log on/go online. I keep getting bad tokens, failed to connect to map server or timing out while playing. Game is not starting/or having graphical issues/glitches. The game is running slowly or you want it to look sharper. The rules of the game, the mods and how to report. I need a quick guide on how to play. I need assistance with something game/forum related. I want to learn how to download/make maps/presets or other customizations for FH. If you still have unanswered questions, feel free to post help threads or contact an online mod. Install the game with the new installers! FeralHeart is more than just a simple flash game and is nothing you can play directly in your web-browser. The list below will show what you'll need. 1. An account here on the FeralHeart site. 2. The game installed on your computer. If you want to play, you need to sign up to our site creating an account. This account will be the one you use for logging into the game later on, but also posting here on the forums. So the site and the forum logins are the same. If you've already are able to post on this site, and know you already created one, you can skip this step. By clicking the text "Register," it will take you to the page you sign up on and it will ask you to fill in a few fields for your account such as. This will create your account and then send an activation mail to the E-mail address you registered with. Click the link inside of the mail and then your account will be ready to use! In order to get the game and play it, you first need to download it from our site. In order to do so, click either one of the "Downloads" tab. Be sure to update your game to the most recent patch version (If you don't do this you wont be able to play online). You can download either the Web Setup or the Torrent, it's up to you which one to install. The PresetSync add-on installation is optional, but if you decide to download it, do not install it until AFTER you have downloaded the Web Setup or Torrent. The Mac / Linux options are for Mac users only. To download the game, make sure you are downloading the latest version of the patch by selecting either Web Setup or Torrent. If you use Internet Explorer, click "Save As" and then save it to a location like the desktop. Once it's downloaded, run the game installer. Just follow the installation wizard until it says it's complete. Once the game installer is done. The game should now be working! 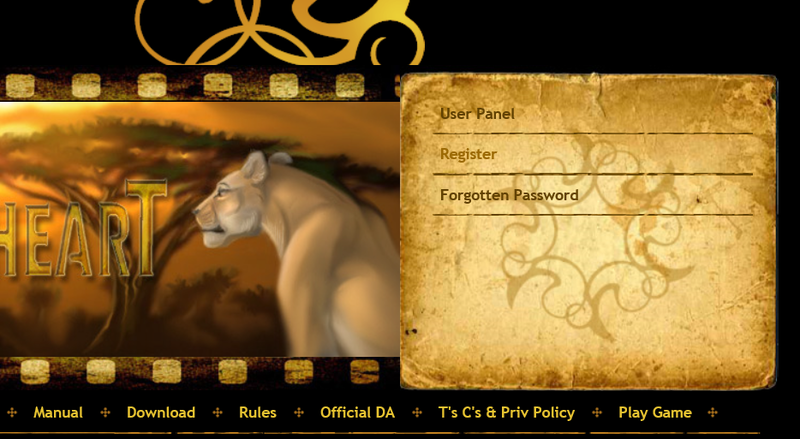 Just open up the Feral Heart application, log into the log-in page, and log in with account you created earlier. Be sure to check the game rules before you start playing. > Rules <. If you were unable to install the game for such reasons as broken installers, or installers unable to finish, check to make certain you have space on your computer for the game. Try downloading the installer once again from our page and install with the NEW one. This game was in first hand made for Windows computers. If you by any chance have a mac, you might be able to play it by looking Here! Linux users and mac users that aren't able to use the version given by the link. Try installing Wine or crossover and running the game through that. 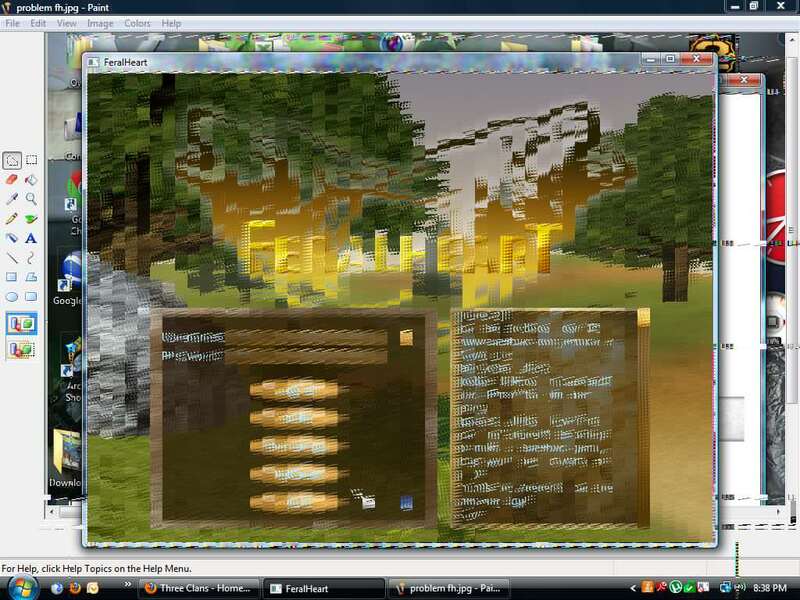 FeralHeart is mainly an online role playing game. This means if you want to get the most fun out of it, you'd need to be connected to the internet. Some people might have issues getting on the actual game, so here's a few things you can try if you have the game but aren't able to go online. 1. Wrong username or Password? 2. Do you have the most recent patch? 3. Check so there's no security software blocking the game. 4. Make sure that you've a solid internet connection. 5. Be sure you have the log-in page open and running in the background. There's actually a "bug" in the current registration system, logging into the game can be a problem for some reasons. If you're unable to log in, and just get banned for 15 mins for getting the wrong pass, here's a few things that might solve it. If you are unable to fix this, it's suggested that you reset your password to your account and set it to a new one without any complicated symbols or numbers, just letters. And if still no success, just create a new account here on the site, and follow This! The game gets updated every now and then with new features or just fixes. In most cases when there's a new patch available users need to download it in order to play. 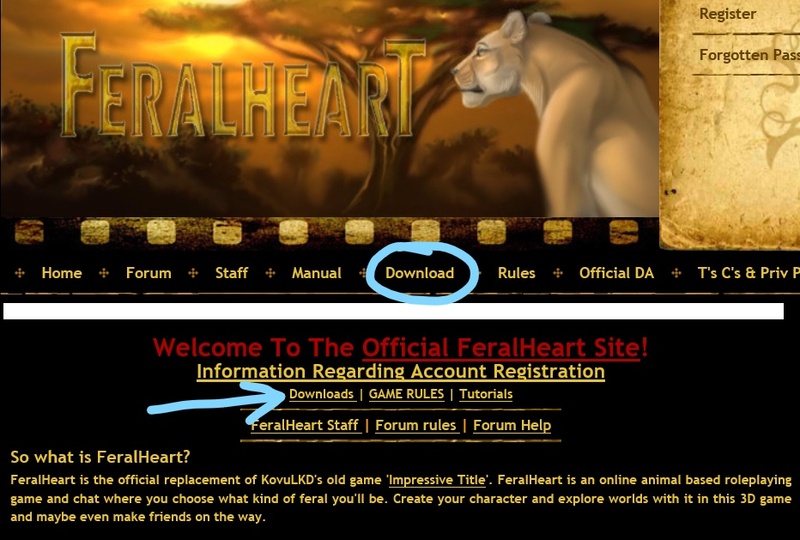 If you get a window when trying to log on the game saying "Please download the latest patch @ feral-heart.com" Then you simply need to download the latest patch from our "Downloads" and install it. Once that's done you can play the game again! Is the computer allowing FeralHeart to connect to the internet? Games like these needs to be able to connect to the internet, but sometimes Windows doesn't know if the game/application can be trusted or it just skips, adding the game to exceptions. If you aren't able to log on the game, this might be your issue. Open up your Control Panel, located in the Start menu. Depending on which Operating system you use and which layout, it might look differently. But Windows firewall should be in the category "security," or just find the text, "Windows firewall" or "Allow a program through windows firewall". This should take you to the correct place. Once there you'll get a new window with a list of programs. Try to locate FeralHeart.exe in there and add it to exceptions by marking the checkbox. If you can't find it, and the game to the list by yourself by pressing "add program." If you don't understand how to do this still, ask someone else to do this for you. Sometimes there might be something else blocking the program from accessing the internet. A good example of these are some Antivirus programs. This can vary a lot as well. But check up if by any chance your virus program might be blocking Feralheart. And just not only by clicking the icon in the corner sayings, "nope!" Look in the advanced menus and preferences first. Only you can check this. Sometimes the internet connection of the users trying to play the game might be weak. This can cause you to not be able to connect or stay online for a longer time. Many people might start blaming the game or server for this when it in fact might be themselves. 1. Are you even connected to the internet right now? 2. Are you running any downloading/streaming programs? 3. Are there any other computers/devices using the same internet? 4. Are you currently using a wireless connection, if so, are you getting good signal? Sometimes the internet connection can time out for various reasons and then jump back on again, so be sure to try a few times first. Downloading things or running streaming programs eats your bandwidth, and this bandwidth is needed in order to play the game, especially if you're using slower speeds. You can start by shutting off things like downloading programs and internet browsers. Maybe even IM programs such as MSN and AIM and try to play again. If you got more than one computer or other devices also using the internet, try turning them off if they're not in use. This will give you more bandwidth to spare. If you're using a laptop you might be using a wireless internet connection. These can sometimes loose their signal to the internet source. So try placing yourself closer to your modem, this might give you a stronger signal. Are you using the log-in page while you play? See above for help on internet connection. If the page isn't refreshing often enough, try looking online to find a page-refresher; most of these are free to use and will ensure the page refreshes for you. A page refresher is in the form of a website that will work with the log-in page to help refresh your page. Be sure you've signed into the account you're trying to log in with. Don't sign into the log-in page with account "Animaluv1" and then try to log into the game with a different username, such as "Animaluv2." Be consistent. If a proxy is preventing you from connecting, you can turn them off by going into your internet or computer settings. Oftentimes a proxy is in the form of a private browsing session-- make sure you turn this off and are not using one while you open the page. You can test to make sure that your IP matches up by looking here. These things should solve the most connection problems! If you have made sure your connection is working fine, and maybe FeralHeart has worked all good before, there still can happen things in the game when walking around in different maps. Examples of these are so called "Bad Tokens", "Failed to connect to map server" messages. Even though the game has it's own server, it's not perfect and can get stuck as well. If you're experiencing troubles a good bet is always to wait a few mins/hours and try again later. It solves a lot of problems. Bad tokens is the servers way to tell you that something went wrong when loading a map/location most of the times. The client failing to communicate with the server, or other way around. If there was some connection problems just during the time you tried to load a new map, this might happen to you. Also maps that has an extreme amount of online users, or more objects and other custom things might take longer to load, and the chance of getting bad tokens might rise. Usually the issue doesn't last for too long and get solved by just trying going through a portal again or loading the character again or just keep reconnecting, for some it's worse than others. Failed to connect to map server is a message you also can get while changing maps and entering portals in the game. It's usually nothing severe either, and as worst, your character might be stuck in that map until there's a reset of the map server process. Another issue similar to this can be if you get the loading screen after choosing a character, but it never loads. Most of the time it should be followed by this "failed to connect" message. If you try to choose another character that isn't placed in the same map, it sometimes let you play since every map in the game, has it's own server process. Sometimes the server needs to be restarted in order to fetch some stuck characters. If you had characters that's been stuck for weeks, you should contact the staff. Failed to connect to front server is another funky message you might get. Most of the time you get this either when your internet is down or the server is down completely. It can also be that your firewall or any other security software is preventing FeralHeart from accessing the internet. If it's the server and not your internet it should be sorted shortly and be back up and running, if it will be down for longer times the staff will let you know. Another cause for this message is failing to open the log-in page extension on the website and having it run in the background while you play. The log-in page was established for security precautions and to esmnaure a safer, stronger server. This also means it's necessary to acknowledge this precaution when logging into the game, so you will have to use this page while you play. You may have signed into the page but are still experiencing issues, in which you should review the possible solutions above, contact a staff member, or look for help in the Help boards of the forum. If the server is up though for a longer time, and you're still having issues to connect, you should follow the tips mentioned in the post "Unable to log on/go online" above, and if that fails to work. Contact those responsible for your internet or maybe someone that knows more and are able to help you. Game is not starting or having graphical issues/glitches. FeralHeart is a game like so many others out there, it needs a computer to do all the work so you can play it. Not everyone can just install the game and it works all perfect for them. Sometimes the computer might even be really old and the game too new. But if you got a computer from the last 5 years, playing this game shouldn't be any problem at all. The ogre errors are something that users can get either when trying to boot up the game or when entering a custom map. These errors come directly from the game, and even though the error messages might look a lil messy, most of the time they actually clearly shows where the problem is. Ogre errors can also come up from broken installers that doesn't install all the files needed to run the game, and in these cases "The magical fix" usually solves this. Uninstall > re-download game > install with new installers. An ogre error example could be as pretty much straight out saying that the following file "Gui Template/Reminder" is missing. And in this case, if something is missing, an uninstall and re-install should do the trick. But there can be other errors like "Items already using the name blabla" or "Failed to create OpenGL rendering." They can vary very much, some are easier to fix than others. If you still are unable to sort it, feel free to post a help thread. Graphical glitches and other weird visuals can show up in different ways, and here's some examples of how it might look. Only Red, green and blue colours showing. You may also experience cut off polygons, weird looking shadows, or missing textures. The absolute first thing you want to try is to change the rendering mode for the game. There's different rendering modes you can pick from, usually OpenGL and Direct3D9. This decides which way your graphic card should process the game. This one is at standard set to OpenGL, so we'd want to set it to Direct3D9. There are two ways you can change this setting. Either you start the game, go into the Options menu (can be accessed by pressing the Escape key on your computer), click the Video tab, and then change the rendering subsystem and restart the game. Sometimes you aren't able to even enter the game, and all you can hear is the menu music, or it just crashes directly after launch. Those who experience this can enter the Feralheart folder located in C:\FeralHeart at standard, find the file called "Ogre.cfg" and open it with Notepad. 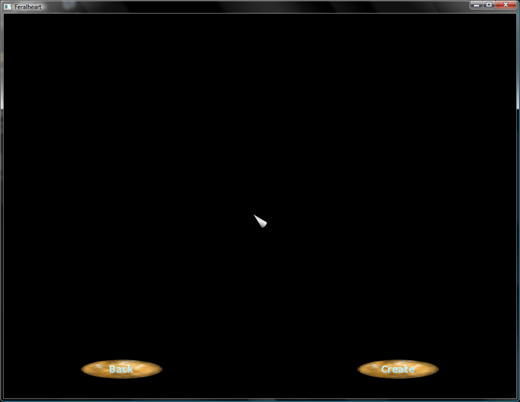 This file works just as the ingame options menu, but instead of buttons and sliders, there's text. Save the file, and close it. Next time you run the game it should boot with the new settings you applied. 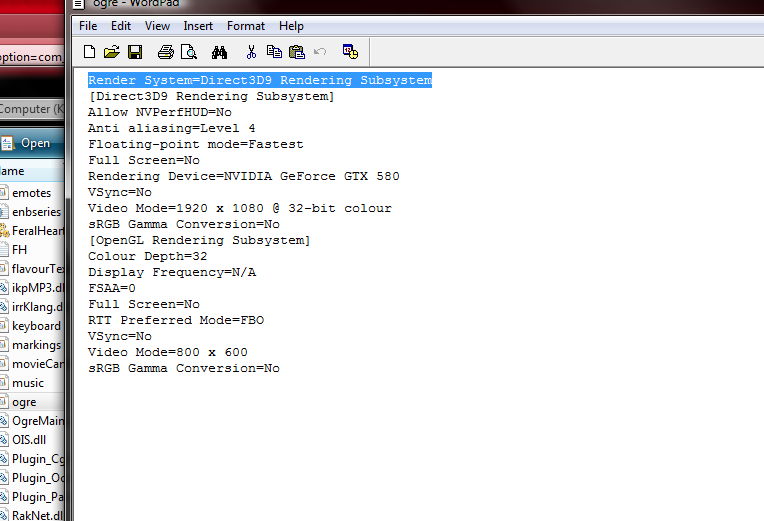 You can also change your Rendering system by setting it to OpenGl instead of Direct3D9. Even though this solves the graphical problems for most, there's still some unlucky ferals out there that the problems still remain, but there's still one more thing you can try, and that is to update your graphic card drivers. A computer is hardware, and with time it gets old just like any other thing in this world. If you had your computer for a while, and never updated the drivers, this might be the cause for FeralHeart not to work correctly. Installing Drivers for your computer is like installing any other program that it might need, though knowing how to do this might be tricky, so check the tutorial on how to Here! If you already tried this and it's not working, chances are that your computer is getting old and can't handle the game. Installing drivers might help, but you're still running the same hardware. Try the game on another computer instead. Performance of the computer means a quite a bit if you are going to have a difference between a choppy game and one that flows like a river. FeralHeart can be very demanding on your computer at times, and not everyone has a NASA computer standing in their closet. This is why the ingame settings are good to have. Want to make the game look sharper and more nice on the eyes? Just turn up the settings. Is the game running slow and is hard to play? Try turning down the settings making it less demanding! Changing the ingame settings have a BIG difference on how fast your game runs, but also how it looks. Down here are two identical screens. One with the highest settings and one with the lowest possible settings (take note that there's a texture mod installed for the felines). So it's not surprising if changing these does some difference. You can also set your own preferences inside the options menu inside the game. Just enter the video tab there and set the the values you want. The higher the value, the more demanding it will be. This decides which kind of rendering that will be used for the game. Try both and see what works best for you. Changes the resolution = How many pixels that will be rendered on the screen. The higher the value, the more sharper things will look, but it will also be more demanding for your computer. This one explains itself, it sets the game in full screen or not. If you like to do other things when you play, keep this unchecked. If you want to focus on the game, and the game only, why not use fullscreen? This is used for even out sharp edges on the screen, the higher the value, the smoother everything will look. This setting is very demanding and is not recommended to use for users with slower computers. Keep it on None unless you know it works well. Turns water reflections on and off. Makes the computer work more. Turn off water reflections if you are experiencing a lag or intense delay in the game movement on-screen. How far you can see the objects in the distance. The game does look nicer with this as high as possible. But if you lower this it will most likely make your game move smoother. Play around with these settings and I'm sure you'll find something that works well. The rules of the game, the mods, and how to report. Even though the game is meant to be fun, even this place has its rules, and you can't just log on and think you can act however you please. There's real people just like yourself playing this game, so following the rules of both the game and forum is important. The Game Rules can be read right here and the mods do expect that everyone reads them. If you didn't read the rules, and then find yourself getting kicked or banned from the game, don't go around whining about it inside the game or on the forum. Read the rules instead and try to understand why you got kicked in the first place. The rules are there to make the game more enjoyable for everyone that plays, and that means EVERYONE needs to respect them. The Mods inside the game are the ones that enforces the rules of the game and make sure people aren't breaking them causing a havoc for the rest of the users. You will notice when mods are around if they might use their red mod text to warn other users about their behavior. More often, though, the red text will not be used frequently, and moderators will interact with one another by using the local chat-- just as you do. Moderators are trusted with the power to kick other users off the game server, and they sure will do so if they catch anyone doing something prohibited. If a mod uses the red text, their identity will be HIDDEN. However, they are not there to make life harder for those playing the game, but they will take action when the need arises. They're simply there to ensure the game doesn't get out of hand. Please respect their actions and let them do their job to ensure everything works smoothly in the game. Becoming a mod is not something you just can choose. The mods aren't just randomly drawn, and there is not a way to apply for being a mod. If you were doing good things for this community, maybe you'll be noticed. But asking around of how to become a mod is definitely not something that's wanted. If you're curious about how moderators are chosen, you can read up on it here. Reporting A User is something anyone can do as long as they have a reason to do this. Even though there are rules to follow, people still break them, either because they never read them in the first place, or because they think it's funny to do this. Reporting a user who is breaking the rules just helps the moderators do their job in the game. Users help might be needed at times. If you want to report someone, take screenshots of the actions in the game by pressing "prnt screen" button on your keyboard while playing. The screenshots will be placed in the location C:\FeralHeart\Screenshots. Simply upload them to a site like imgur.com, photobucket, or imagehack, and send the links to either an Administrator, Global Mod, or Moderator here on the forum via PM. There's a forum Modlist that will show who in the game is a staff member, and it can be found here. For an in-depth guide on how to properly submit a report, look here. Issues with downloading, logging in or posting. Issues with downloading the game, logging in or posting. You can't download the game? The downloads on the official download page should always be up for grabs no matter when you try to get it. And I'm sure there could probably be quite a few reasons why someone aren't able to download. The issue could be browser related. Such as preferences in it preventing you from downloading the game. In this case you should look in your internet browser settings and see if there's anything odd looking. Maybe even try another web-browser, that solves the issue for some. Are you checking where you actually place the installer after you download it? The best thing is if you save the installer onto your computer, preferably someplace like your desktop (as you might forget where you saved it). So try downloading it again and make sure you know where you saved it. The network you're currently might now allow downloading; this could be normal if you use a school network or if you're at work. If so, you should try downloading it elsewhere. The download link might be temporarily broken or maybe there's a change for a new patcher. If this problem remains for a longer time and you know others aren't able to download either, you should contact a staff member. Issues with logging in or posting? Yeah, this is something we don't like getting. There could be a several reasons why you aren't able to log on the site or post, and here's a few. 1. You keep timing out when you try to log on/posting. 2. The site is currently down. 3. You've been banned or your IP is blacklisted (sometimes surfing the forum still works). 4. You're having web browser-related issues. 5. The login page won't log you in. 1. If you keep timing out, you should check your internet connection. It might be weak at this moment. If it isn't your connection, it can actually be the site that's slow at the moment, so don't panic. Try to wait a while first and try again later, it solves it sometimes. 2. If the site is down, really slow, or if you are receiving an error message when attempting to access the website, not much will happen at all. Check back again later, and it might be up. 3. If you don't behave on the forums you might get banned for a certain period of time. This ban can be in different ways. Not only in how long it is-- such as one day, one week, or for years. But you can also become banned from making posts, or banned from viewing the boards at all. Usually there's a message in this case explaining why you're banned. But if you're using a shared internet, such as a college internet where someone has been doing bad things on it, the IP adress might be black-listed, preventing you from accessing the forum or certain parts of it. In this case, there's not too much to do about it. 4. Sometimes the issue can be just something spazzing up. Try logging out from the forum by clicking the "logout" button along the forum indexes, and then log in again shortly after. 5. If the login page will not let you log in, or clears the form for the login, it is likely you have a connection issue, or it is a problem with the browser you are using. You can solve this one of many ways. Going through to see if your connection is faulty, or you are connected to the internet. Another would be trying a different browser, such as Google Chrome, Firefox, Internet Explorer, and the others. Using another browser or making sure you stay connected is a good way to stop the login form from clearing. If the issue still remains, you can also try deleting all the cookies for the site, restart the browser, and then try again. How to do this can vary from browser to browser. Usually you can find this option inside the Tools/preferences menu of the web browser. In Firefox, you can do this by pressing "Tools > page info > Security > Cookies". Most of these issues are temporary, though, so if you restart the browser and just try again, it usually works. Even though FeralHeart should be fairly easy to learn, people might want a kickstart on how to play the game or maybe need to learn just a lil more, there's always ways to get aid. Want to learn the controls before you start playing? There's a Documentation part explaining the controls and ingame settings for you, and if you're new, it would be healthy doing so. You can find it here together with some other nice tutorials. You may also need some help! If you have any questions in regards to game play, you can visit this little helpful board and ask other members of the community for help. Surely, they can help you there! Link here! But I meant more like how to act on the game and what to do! Actually, this game is something you need to play and learn. However! If you want someone to show you the ropes, or just tell you more about the game, feel free to send a pm to any of the mods or maybe even other active users here, I'm sure they'd be glad to help! You might even be able to log on the game and ask someone in the game to actually help you. Most in this community are more than willing to help, so don't be afraid to ask.